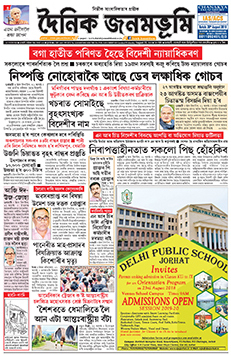 Dainik Janambhumi (Assamese: দৈনিক জনমভূমি) is a highly respected Assamese daily newspaper. Launched in 1972 from Jorhat town in Upper Assam, the newspaper as well as the epaper is popular in the Upper Assam districts. Dainik Janambhumi is owned by the Janambhumi Group of Publications. Its headquarters is at Nehru Park area in Jorhat. In addition to Jorhat, Dainik Janambhumi has two other editions from Guwahati and Tinsukia. The two new editions were launched in 2004. Utpal Baruah is the Editor.